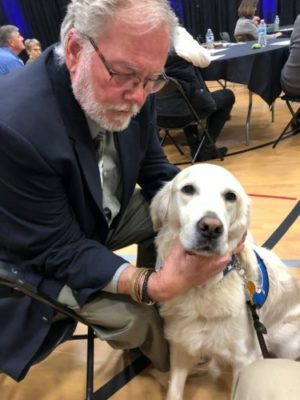 Reformation Day – Eddie, and Again The Neighbor | "Northern Crossings"
Here is the comfort dog Ernie. Like good Lutherans everywhere he does not want attention. We have to hold his head to get his picture. He was at the Dakota Girls and Boys Ranch and he is beautiful. This has been a wonderful and exhausting month. We had the concert with the Popple Ridge Pickers for Project 24 and we had the Dakota Girls and Boys Ranch Mercy conference and then the Reformation, Mission Mercy services at Zion last Sunday. All of these events focused on the welfare of the neighbor and the love that God sheds abroad in our hearts through Christ Jesus. We spend much of our lives as confessional preachers trying to explain the difference between the Law and the Gospel and the salvation of the sinner apart from good works. We are of course accused of denying that Christians should be good and when we tell folks that they need to do stuff for their neighbor we are accused of work righteousness. Some times it seems in earthly terms that we can’t win for losing. Jesus got that – He asks in Luke 7 to what should he compare that generation – 32They are like children sitting in the marketplace and calling out to one another: ‘We played the flute for you, and you did not dance; we sang a dirge, and you did not weep.’ 33For John the Baptist came neither eating bread nor drinking wine, and you say, ‘He has a demon!’ 34The Son of Man came eating and drinking, and you say, ‘Look at this glutton and drunkard, a friend of tax collectors and of sinners!’…Luther despaired for a time and was frustrated at the duplicity of the human heart that wants what it wants, and human will that wills what it wills. Luther pounded home the truth that we are not saved by works and he pounded the fact that we should do works for our neighbor. Commenting on the work of government and the feeling of some that they should be the caretaker of the neighbor Luther lays out John 15:13. Mercy Medical Trips – Want to go?